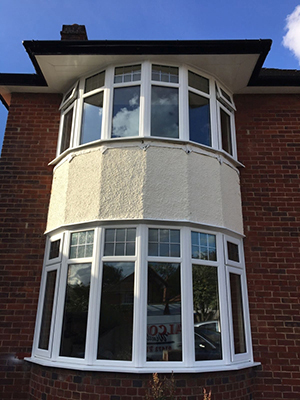 Falcon Windows: the installer of choice in quality PVC-u double-glazed windows in Ipswich, Suffolk and Essex. At Falcon Windows, we offer quality PVC-u double glazed windows in Ipswich, Suffolk and Essex . 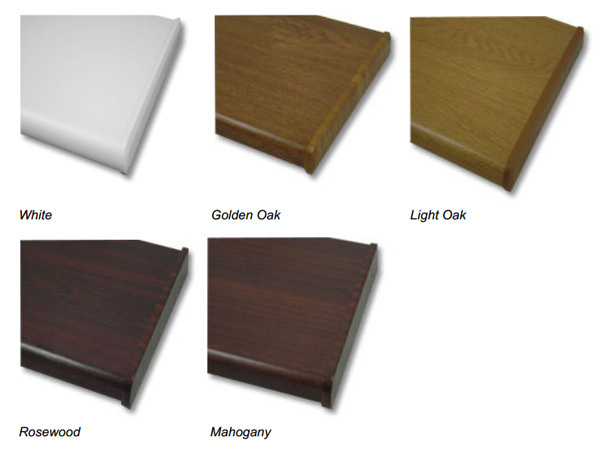 Our windows are internally glazed for security and are available in white, light oak, rosewood, light oak on white and rosewood on white finishes. Our Ipswich-based installation teams pride themselves in delivering a quality installation service and we are delighted that this is very much reflected in the excellent testimonials which our customers choose to share about the quality of Falcon Windows workmanship. We offer fixed price contracts, so that you can rest assured and know the cost of the job even before we start. It is our policy to take a 10% deposit on work we install. A 50% deposit is applicable to all trade windows supplied to customers within the building and installation trade. The right windows for you, whatever your property. Casement windows, sliding sash windows, convenient tilt and turn or feature arched windows and coloured windows - Falcon can advise on the right options for your property whether you are considering uPVC or aluminium frames, intricate bays or simply secondary double glazing. Historic, modern, urban, rural - whatever the age or location of your Suffolk property, Falcon Windows can help find the perfect solution, thanks to more than 30 years working on properties across East Anglia. For heritage buildings requiring conservation windows and doors in Ipswich and Suffolk, the Falcon Windows team have the experience you need as we regularly supply and install windows for listed buildings across the county of Suffolk. If for example, you're looking for replacement sash windows, wooden vertical sliding windows or PVC-u vertical sliding windows for your Suffolk property in Ipswich, we have the detailed product knowledge, understanding and expertise to help. Vertical sliding sash windows are often the preference of customers looking to replace old traditional boxed sash windows which have seen better days and need to be completely replaced. In towns like Ipswich UPVC vertical sliding windows are popular due to the age of some properties. Once installed, they look a very close match to their wooden predecessors. 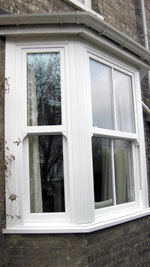 Should your timber box sash windows are not past repair, then Falcon Windows will also be pleased to help. Simply give us a ring and ask us to quote you for repair rather than replacement. Our local in-house carpenter regularly repairs damaged sash windows in Ipswich, replacing not just damaged parts of the frame, but replacing the glass too as necessary. And if part of your thinking behind the consideration of replacement windows is a need for a quieter life, why not just give us a call? Whether you'd like to hear less of the traffic, of the neighbours or of local farm animals if you're in a village location, we can also offer noise reduction double glazing solutions to suit your town or country needs. Interested in getting a quote for your new windows? All our windows and doors help reduce your heating bills by keeping your home warmer. The energy rated double-glazed windows which we install in and around Ipswich are high quality units and represent real value for money. Take a moment to weigh up the ever-increasing utility bills against any additional cost to have the best, energy-rated windows fitted and it soon all makes sense - it simply works out cheaper in the longer term to install the best product on the market at the time. 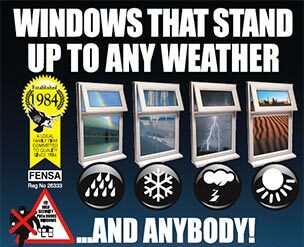 What's more, Falcon customers really appreciate that we are a FENSA registered company, feeling safe in the knowledge that the products installed by Falcon Windows are all properly reviewed and regulated. In fact, we've been an approved window installer in Suffolk since 1984 - now there's peace of mind. You'll find that all quotations from Falcon Windows are totally free of charge and without any obligation too. We do our very best to get back to our customers within up to 48 hours, depending on how complicated the quotation may be. If there's an urgent need and it's imperative to have the quotation really quickly, we'll do our utmost to turn it around within 24 hours. All our quotations are sent by email as well as in the post. Read more about next generation double glazing and energy ratings here. Don't worry, we're not claiming that our installation teams are particularly handsome - we employ them first and foremost for their skill of course! - but these days, there can be more to windows looking pretty than just style, colour and finish. In Ipswich and Suffolk slimline aluminium windows are becoming increasingly popular with architects. The innovative aluminium frames offer sleeker and stronger profiles and can also be available in stylish colours and finishes. We've recently had a few of our customers request coloured aluminium windows in Aldeburgh, Suffolk. Even though the aluminium windows come at a premium over PVC equivalents, they are not just aesthetically more pleasing to the eye thanks to their thinner and less bulky frames, but they also let more light into the property and simply allow more of any view to be admired. Warm-core aluminium technologies now mean that aluminium windows or bi-folding doors can be super-insulated and really energy efficient too. Talk about appearance & style! Your windows make a real statement about your home. A change of window style and design can really transform the whole appearance and visual impression of a property. All too often though windows just all look the same or unfortunately seem inappropriate for their setting. Take a look at the products on offer from Falcon Windows in Ipswich however and you'll soon notice the differences available in both design and style. Our window frames look elegant and have a Scotia-moulded, shaped edge which enhances their appearance - they're far from the clinical, hard shapes of the traditional replacement windows. With the wide range of designs available, you can choose a window style that really suits your home, whether that happens to be traditional or contemporary and of course, the long-established Falcon team are on hand to share expert advice too. There's a choice of stunning patterned glass for bathroom windows and front entrance doors which can have either Georgian Bars, traditional-style leaded lights or beautifully designed decorative inserts. Our window frames can come in many colours too. We install all types of coloured windows in Ipswich Suffolk - simply select your choice from the wide range of RAL colours available. And if you want a different colour inside to out, like a bright green finish outside and white in, that's all possible too. Foiled cream windows and 'country' colours such as Chartwell green are currently popular choices as well as chic anthracite grey and stylish light blue window frames. On the whole however, coloured windows tend to be coloured on the outside and white on the inside. Whatever you have in mind for your new windows, whatever catches you eye from the extensive range of replacement window products on the market, Falcon Windows of Ipswich can install them for you. We are pleased to offer all styles of windows, with solutions to suit new builds all the way through to traditional houses and more period properties. We provide very high quality window and door systems with a customer service which is simply second to none. Good looks might be one priority, but you'll want to be sure that your new windows are robust and reassuringly secure wherever you live. PVC-u is very reliable and trustworthy when it comes to security due to its resilience and robustness. PVC-u frames are constructed to incredible hardness, making windows and doors very difficult to damage or break through. Their strength is extremely impressive. Aluminium is considered to be even more secure and almost totally burglar-proof due to its strength, but PVC-u is not far behind. At Falcon Windows, all our windows also feature our Maco shoot-bolt locking system - another reason why you can have peace of mind that you will be safe within your own home. Do you find that there are simply not enough hours in the day? There are so many things to do in life and although you know that your home is a major financial investment, looking after it and keeping it 'up to scratch' can drop down the priority list. With u-PVC windows from Falcon Windows, you can kiss that guilty conscience good-bye and get on enjoying life and your home as a place of comfort, a haven for the family to relax and enjoy, feeling safe and secure. No more painting or wood-staining required, virtually "maintenance free" PVC-u windows are a popular choice for modern living - no need to worry about your home looking shabby or untidy due to poorly maintained windows, sit back and watch your u-PVC windows and doors retain their good looks over the years without hardly lifting a finger. The use of un-plasticized Polyvinyl Chloride or PVC-u has grown hugely in popularity and is now one of the most recommended and most widely chosen materials in use by the biggest double glazing companies. Here, some of the key advantages and disadvantages to using uPVC over its alternatives are briefly outlined and explained. Another hugely appealing feature of PVC-u is that it is remarkably low maintenance. Timber and woods generally require a re-paint every 5 years alongside occasional refilling jobs and patching due to their tendency to rot and flake. Aluminium is resilient, but still needs attention every now and then. PVC-u frames however never rot, flake, rust or fade. Apart from a quick wipe with a cloth to keep them clean, u-PVC frames require virtually no maintenance - what a convenient and time-saving solution! Un-plasticized Polyvinyl Chloride is also the most durable of the materials available. Woods can rot and start to warp over time and aluminium can pick up rust, whereas uPVC is strong, tough and resilient. It is highly unlikely that PVC-u will need to be changed and some companies even offer up to 10 year guarantees on PVC-u double glazing. Resilient and robust, PVC-u is very reliable and trustworthy when it comes to security. U-PVC frames are extremely difficult to break through or damage. Aluminium is similarly if not more secure, almost totally burglar-proof, however u-PVC is a close second. Insulation is another feature of the PVC-u material that surpasses woods and aluminium. It was created to be a very competent insulator and provides the best heat and energy insulation available. It is a very good insulator compared to the alternative of regular aluminium and timber and this ability to keep heat in and sound out is largely responsible for its popularity. The major shortcoming of pvc is undoubtedly its aesthetic value. In many people's eyes, it's simple, white plastic look is far from attractive and some consider PVC-u frames to look unstylish or plain when compared to timber and aluminium. Different colour products are now however available, but when replacing windows whilst trying to keep the character of the home, it may not be ideal. For listed buildings and those within conservation areas, local planning councils would often be likely to insist on timber or aluminium frames. At Falcon Windows, our approach is straightforward. Firstly, when you get in contact we'll arrange for a short visit to discuss your requirements and survey your windows,doors or conservatory.. We listen to what you have to say, because we know that our customers may be considering double glazing for many different reasons. Some require sound proofing or good insulation; quality windows that are attractive perhaps; high security options or just want a reliable, maintenance-free solution. We believe that our windows and doors meet all these requirements and are confident in delivering what most customers want. We will send you a professional, computer-aided colour quotation for your perusal, so you can decide in your own time and in the comfort of your home. 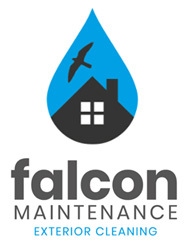 At Falcon Windows Ltd based in Ipswich, Suffolk, we are proud of service which we provide and it shows when our employees are installing on site. Our installation personnel are welcoming, helpful and attend to our customers' needs wherever possible - if there's an external wire which requires diverting, a doorbell that could do with being re-installed or even just net curtains which need re-hanging, then they're happy to be there to assist. We are very open about the fact that our ingenious bonus scheme is based on customer feedback , so it's always in our employees' interests to do a first-class job. This way everyone enjoys a really positive outcome and we are proud to hold on to all testimonials for our records, along with photographs of all our finished work in our many albums. In the trade? Or just looking to install your windows yourself? 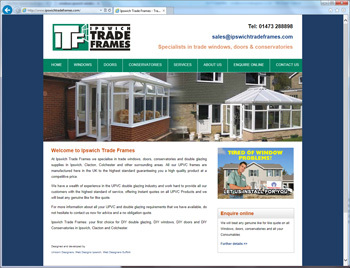 Under the guiding hand of Jordan Sheppard, Ipswich Trade Frames specialises in the supply only of PVC-u trade frames to tradesmen and DIY build customers. For a window quotation or to inform the Ipswich Trade Frames team of your requirements and window sizes, contact Jordan and you will have a written quotation returned within 24 hours. Trade Windows in Ipswich have become more popular over recent years as some of our customers have wanted to save money and install them themselves. Jordan has had many a compliment on how professionally he runs this side of the business, giving excellent written quotations. Ipswich Trade Frames require a deposit and all orders in writing and require their trade and DIY build customers to sign a 2-part contract, so each party knows exactly what sizes and style of windows have been ordered. The balance of the invoice is paid on the safe delivery of the frames, once the trade partner's customer is satisfied. Need your window frames cleaned or serviced?